The Battle of St. Louis (San Luis in Spanish), also known as the Battle of Fort San Carlos, was an unsuccessful attack led by the British on St. Louis (a French settlement in Spanish Louisiana, founded on the West Bank of the Mississippi River after the 1763 Treaty of Paris) on May 26, 1780, during the Anglo-Spanish War. A former British militia commander led a force primarily of Indians and attacked the settlement. Fernando de Leyba, the Lt. Governor of Spanish Louisiana, led the local militia to fortify the town as best as they could and successfully withstood the attack. 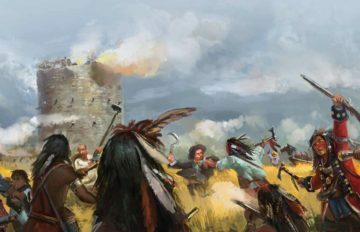 On the opposite bank of the Mississippi, a second simultaneous attack on the nearby former British colonial outpost of Cahokia, occupied by Patriot Virginians, was also repulsed. The retreating Indians destroyed the crops and took captive civilians outside the protected area. The British failed to defend their side of the river and, thus, effectively ended any attempts to gain control of the Mississippi River during the war. Armies - Spanish Forces was commanded by Spanish settlers and consisted of about 320 settlers and militia. British Forces commander was unknown and consisted of between 900-1,200 Soldiers. Casualties - Spanish casualties were estimated to be 50-100 killed/wounded/captured. British casualties was approximately 4 killed and 4 wounded. Outcome - The result of the battle was a Spanish victory. The battle was part of the Anglo-Spanish War 1779-83. The Spanish entered the Revolutionary War in 1779. The British military planners in London wanted to secure the corridor of the Mississippi River against both Spanish and Patriot activity. Their plans included expeditions from West Florida to take New Orleans and other Spanish targets, including several expeditions to gain control of targets in the Upper Mississippi, such as the small town of St. Louis. The expedition from West Florida never got off the ground because Bernardo de Gálvez, the Governor of Spanish Louisiana, moved rapidly to gain control of British outposts on the Lower Mississippi and threatened action against West Florida's principal outposts of Mobile and Pensacola. Patrick Sinclair, the military governor at Fort Michilimackinac, organized the British expeditions from the north in present-day Michigan. Beginning in February 1780, he directed traders to circulate through their territories and recruit interested tribes for an expedition against St. Louis. Sinclair offered the fur traders the opportunity to control the fur trade in the upper parts of Spanish Louisiana as an incentive to participate. The Chippewa chief, Matchekewis, was given overall command of the native forces. When the force reached Rock Island, they were joined by about 250 men from the Sac and Fox nations. These warriors were somewhat reluctant to attack St. Louis, but Hesse gave them large gifts to secure their participation in the venture. The diversity within the expedition led to some animosity among the tribes. The Chippewa and Sioux, in particular, had a history of conflict with each other. However, Wapasha and Matchekewis promoted unity during the expedition. The village of St. Louis was primarily a trading hub on the Mississippi River that was governed by Lieutenant Governor Fernando de Leyba, a captain in the Spanish Army, but it was also the administrative capital of Upper Spanish Louisiana. 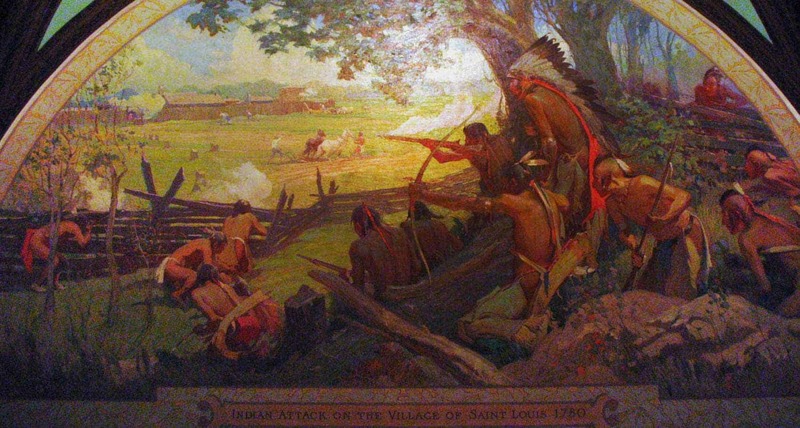 Leyba was warned by a fur trader in late March that the British were planning an attack on St. Louis and the nearby American post at Cahokia. He began developing plans for the village's defense. He had an inexperienced militia force of 168 dispersed around the surrounding countryside and only 29 regular army soldiers of the Fijo de Luisiana Colonial Regiment. Leyba developed a grand plan of defense that included the construction of four stone towers. Without funds or the time to get them from New Orleans, Leyba asked the villagers to contribute funds and labor to the construction of these fortifications and paid for some of the work from his private funds. 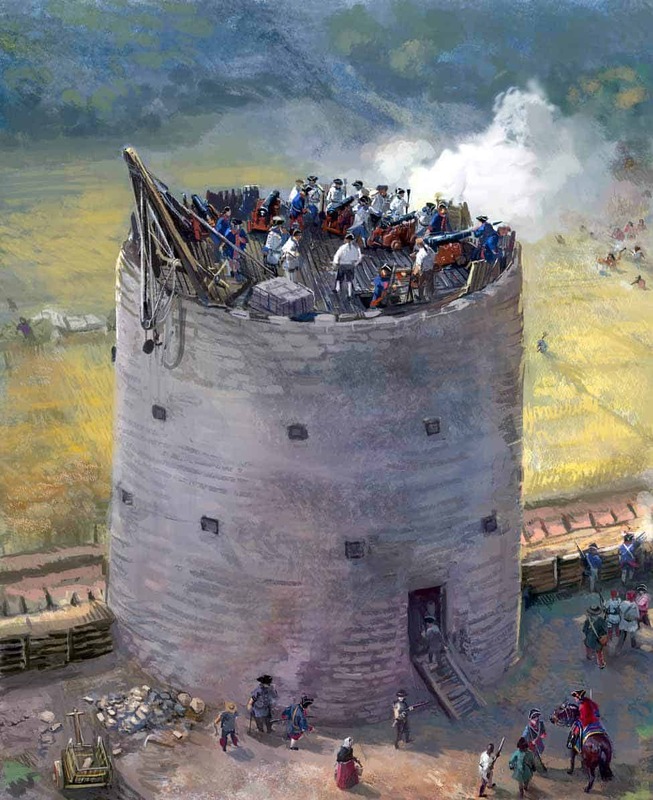 By mid-May, a single round tower had been built that was about 30 feet in diameter and 30 to 40 feet tall. The tower, dubbed Fort San Carlos, provided a commanding view of the surrounding countryside. As there did not appear to be sufficient time to build more towers, trenches were dug between the tower and the river to the north and south of the village. Three four-pound and two six-pound cannons from Fort Don Carlos were mounted in the tower, and other cannons were emplaced at each end of the line of trenches. Fort Don Carlos had been constructed earlier in 1767 on the south bank of the Missouri river, near its mouth, just 15 miles north of the village of St. Louis. With a force of only 197 men, 168 of whom were inexperienced militia, it was highly probable that the opposing British and Indian combined force of 1,000 would overwhelm the Fort San Carlos. However, Leyba appealed to François Vallé, a 64-year-old French inhabitant, former captain of the French militia, who was located 60 miles to the South of the fort at the site of the French Colonial Valles Mines. Valle sent his two sons and 151 well-trained and equipped French militiamen and thus tipped the scale in favor of the defenders. By Royal Decree on April 1, 1782, King Carlos III of Spain conferred upon Francois Vallé the rank of lieutenant in the regular Spanish army, thus making him a Spanish don. Valle also aided greatly in the Battle of Fort San Carlos because he gave the defenders of both forts a major tactical advantage by supplying them with genuine lead (instead of pebbles or stones) from his mines for musket balls and cannon balls. As a result of his contributions, Francois Valle was called the "Defender of St. Louis". On May 15, Leyba was visited by John Montgomery, the American commander at Cahokia, who proposed a joint Spanish and American force to counter Hesse's expedition, an idea that never reached fruition. On May 23, Leyba's scouts reported that Hesse's force had landed their canoes only 14 miles away and were coming overland. On May 25, Hesse sent out scouting parties to determine the situation at St. Louis. These parties were unable to get close to the village due to the presence of workers in the fields outside the village. On May 26, Hesse sent Jean-Marie Ducharme and 300 Indians across the river to attack Cahokia, while the remainder arrived around 1:00 pm near St. Louis. A warning shot was fired from the tower when they came into view. The Sioux and Winnebagoes led the way, followed by the Sac, Fox and fur traders, including Hesse, in the rear. Leyba directed the defense from the tower and opened fire on the approaching enemy from the trenches and tower when they came in range. On the first volley, most of the Sac and Fox fell back, apparently unwilling to fight, leaving many of the other participants suspicious of their motives in joining the expedition and complaining of their "treachery." Wapasha and the Sioux persisted for several hours in attempts to draw the Spanish defenders out. They went as far as brutally killing some captives they had taken in the fields. Although this angered some of the townspeople, Lebya refused to grant permission to the militia to make a sortie. The attackers eventually withdrew and headed north, destroying crops, livestock, and buildings as they went. On the other side of the river, Ducharme's attack on Cahokia was easily repulsed. George Rogers Clark made a timely arrival to lead Cahokia's defense. Clark's reputation as a frontier fighter made the Indian force reluctant to pursue the attack. The village of 700 inhabitants lost between 50 and 100 people who were either killed, wounded or captured. Virtually all casualties were civilians. A year later, the Spaniards from St. Louis raided Fort St. Joseph and brought the captured British flag back to St. Louis. Leyba died the following month. He was the subject of local criticism because he never formally recognized the efforts made by the citizenry in the town's defense. King Charles did not know he had died and promoted him to lieutenant colonel because of his valor in action.